My boyfriend hands over two crisp dollar notes. The official hands back our passports and checks the notes, making sure they’re not bent or marked. 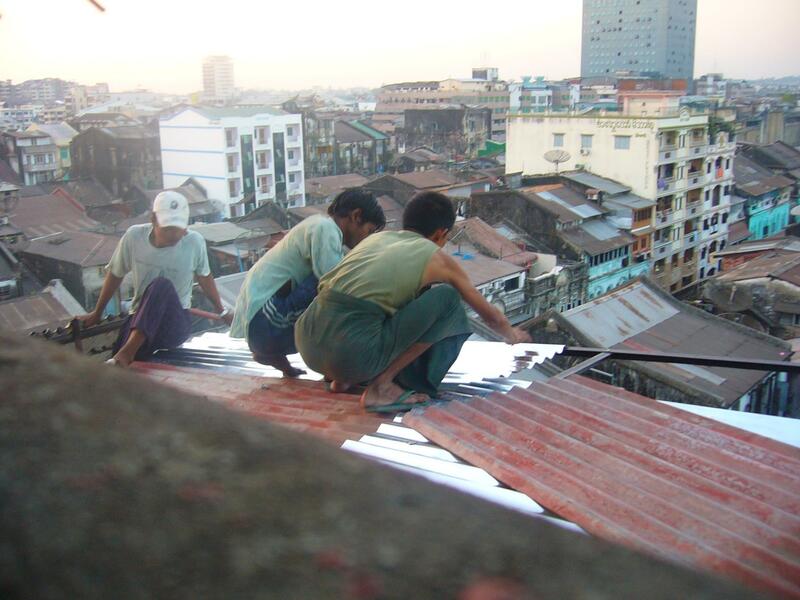 This is how it works in Burma. Painstakingly, he fills out two tickets and escorts us to the platform, tells us to wait. We note a solider standing near us, wearing camouflage trousers and rubber jandals. It might be paranoia, but everyone associated with the Burmese government seem to have a menacing air, the kind you’d get walking into bar in the wrong end of the Hutt Valley. Another official leads us on to the train, instructs us to sit at the end of the carriage and ropes it off. The other passengers climb on and crush together, while we sit in awkward but relative comfort. As we bunny-hop along the tracks, a small child escapes his mother’s grip and sprints under the rope towards us. For a moment there’s a stunned silence, until the kid yanks at my boyfriend’s arm hair and shouts something. The nervousness dissolves into giggles, and the ice is broken. 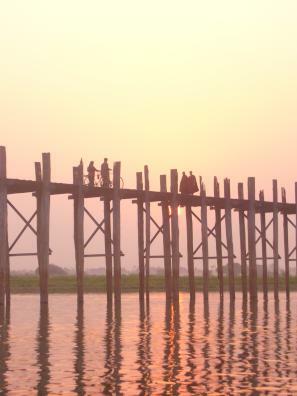 The three-hour rail circuit takes us out of rickety, dusty central Yangon, past the notorious Insein prison and into the rice-paddies of the surrounding countryside. Multitudes of people get on and off, few are allowed past the rope, all stare. 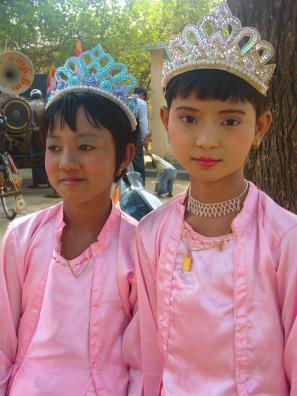 White faces have become something of a novelty in Burma of late. The aftermath of Cyclone Nargis and the trickle-down from the unrest in Thailand has virtually destroyed the fledgling tourism industry. Tourists do come, but so few that after two weeks there, we knew almost every foreigner on our flight back to Bangkok. By far the biggest factor keeping tourists away is the military junta, its imprisonment of Burma’s democratically elected leader, and wide-scale human rights abuses. Since 1962, the country has been ruled by a ruthless, and highly superstitious, military dictatorship that has conspired to control the population through fear and poverty. In the decaying cities electricity supply is sporadic, the people are super-model thin and the malign threat of the military seems never far away. “In my country”, one outspoken taxi driver told us, “you do not ask why”. In the light of wide-spread economic and diplomatic sanctions against Burma, a number of human rights groups discourage travelling there, arguing it puts American dollars in the hands of the junta. On balance, we decided we would do more good than evil. Especially considering that the Government’s income from tourism is dwarfed by revenue from the export of rubies, opium and minerals. US sanctions mean there are no foreign banks or ATMs in Burma, and no facilities to cash travellers’ cheques. The only option is to carry enough cash to last the whole journey. Between us, for two weeks, we took US$600 and lived on a tight daily budget. Aside from an accidental meal at a Government-owned restaurant, occasional rail travel, the departure tax, and the unavoidable entry fee to the Bagan temple site, we ate, slept and travelled with family-run businesses. And, for these families, our kyat made a positive difference. Coming from a open, multi-cultural society, it’s hard to imagine the suffocation and isolation of the Burmese. Email, social networking and media websites are blocked for those who can afford the luxury of the Internet, international calls are US$5 a minute and media is Government controlled (we read the English daily paper The New Light of Myanmar for a good laugh). For Burmese with a good grasp of English, foreign tourists are a natural source of knowledge about the outside word. As we wander across town following our bum-numbing rail tour of Yangon, we are accosted by a young woman. “Sister, sister, where are you from?” she asks, grabbing my arm. Having just been in Cambodia, where such attempts to engage in conversation usually end with a determined sales pitch, I’m wary. Especially when she began dragging me through a dark doorway. 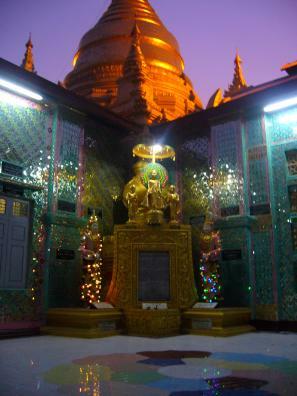 Inside are two dozen young Burmese sitting around low tables, poring over text books. For the next hour we sit at a table with a few of the students, conversing under the guise of test preparation. They are young, curious, anxious to escape, and they want to know everything about us. What is the weather like in New Zealand, what do you do (officially I’m a waitress), our thoughts on the global financial crisis, where have we been in Burma, are you boyfriend and girlfriend. Giggles at the affirmative answer. A young monk, who I suspect of flirting with me, carefully writes out his email address and instructs me to befriend him on Facebook. Where there’s a proxy server, there’s a way, apparently. It’s not an isolated incident either. Wherever we go, be it pagodas, markets or restaurants, young English speakers want to buy us milky tea, or the locally produced energy drink “Star Power”, and talk with us. We skirt around politics – it’s illegal and imprudent to discuss such things with foreigners – but they’re not shy about anything else. 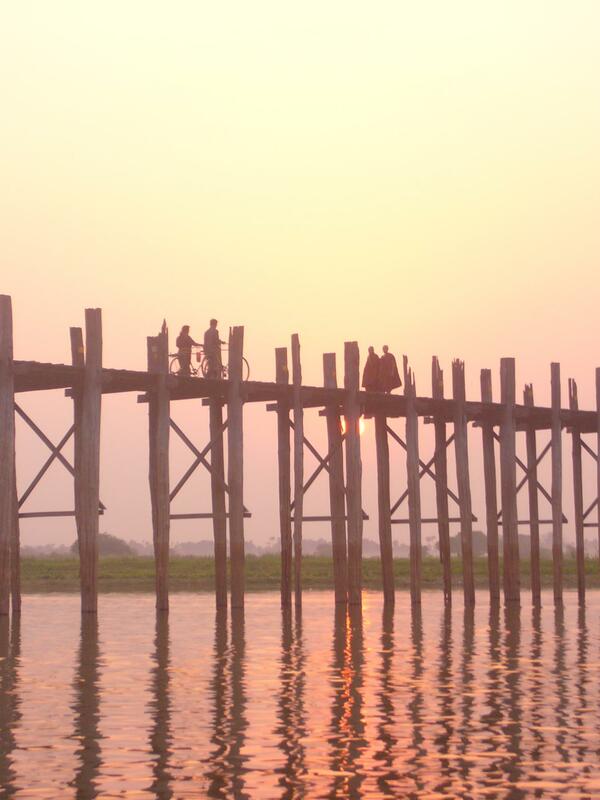 Our itinerary takes us next to the cultural capital Mandalay. It’s more relaxed than Yangon. People are allowed to driver scooters, and a subversive comedy troupe performs for tourists. At the same time, however, you’re more likely to be hassled on the streets to take a ride in a tri-shaw, or to buy trinkets. Several small towns on the outskirts host beautiful pagodas and historic buildings which, unless you request your driver to take you to the back entrance, will cost you US$10 to see. In the small town of Hsipaw, a gruelling seven hour bus ride over dusty, unsealed roads north from Mandalay, we come face-to-face with the reason there won’t be democracy in Burma any time soon. One of the last stops before the Chinese border, the town has a constant supply of electricity, large trucks on the road, and a new bridge under construction. The town is awash in Chinese money.